The first great American fairy tale for children, L. Frank Baum's The Wonderful Wizard Of Oz became an instant classic when it was first released, and has since been read by millions of people over the last century-plus. Dorothy, the Wizard, the Scarecrow, Tinman, the Cowardly Lion, Glinda the Good Witch, the Munchkins, even Toto...they all start here. No story in history is more loved, and the famed film musical of the story with Judy Garland is perhaps the most viewed and loved movie of all time. 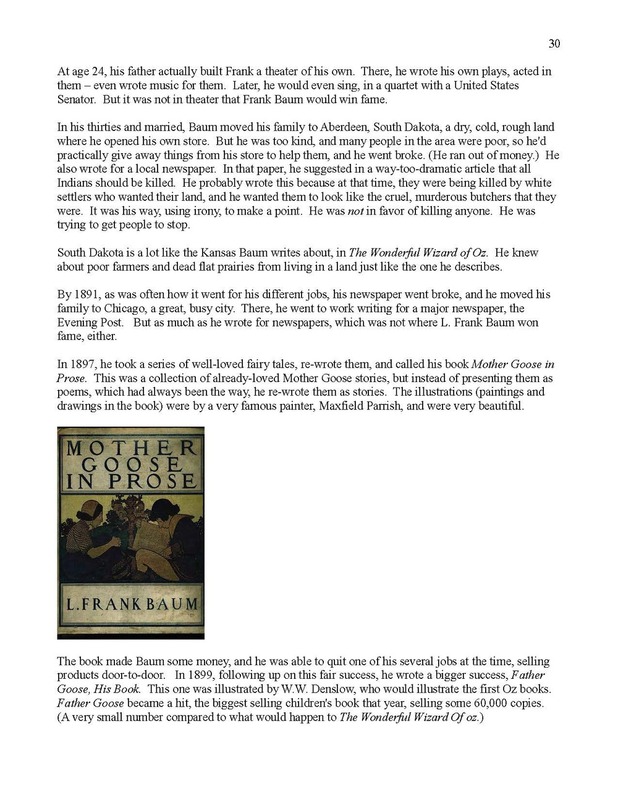 The history of the period of time is explained, so that the student understands why Baum wrote the book, and what he was trying to say to his readers about their time (and ours). L. Frank Baum's personal history is also explored, and the student relates what he's learned about Baum's' life to the story, and how Baum's' own experience helped to create this masterpiece. The history of the book itself, its publishing successes is considered. Important devices in writing are explored and explained, such as the message of a piece (the idea the author wishes to communicate and earn agreement for), plotting, characterization, conflict, language, irony, the use of surrogates (characters representing the author and his/her point of view within the story), and other tools. New understandings of the tools of good story-telling are then used by the student to analyze and understand the story. No additional materials are needed. The entire book is contained in the course, broken into chapters. Before reading each chapter, the student looks though the simple, single definition that applies, for every key or difficult word used in that chapter. This will allow the student to understand what he reads the first time he reads it. Locations mentioned in each chapter are also listed before the reading starts, and they are located by the student on maps or globes. In this way, the student will know where those places are in the world when encountering them in the story. After each reading section, the student is provided numerous exercises which demand cognitive and critical thinking on the student's part. The exercises help make the story more relevant to the student, and increase his understanding of the story and its unique values. We even provide some links to film and/or other presentations of the piece being studied!